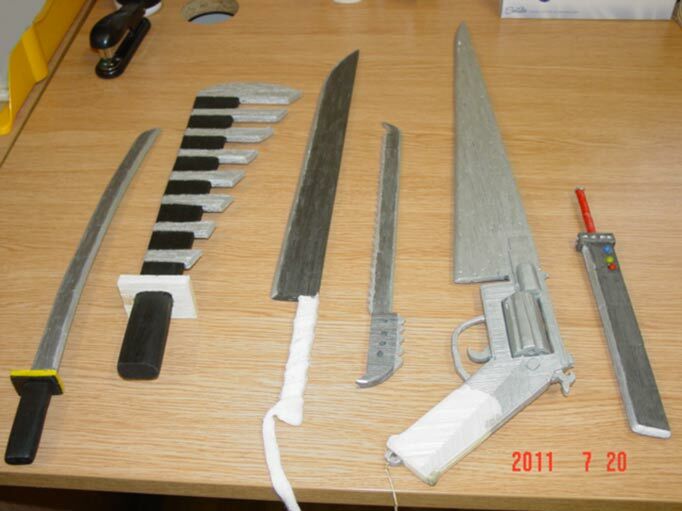 An inmate in a Welsh prison built Final Fantasy weapons out of matchsticks. The guards of a prison located in Monmouthshire, Wales were surprised to find an impressive arsenal of replica knives that a prisoner had assembled entirely out of matchsticks and glue. The prisoner in question, though, must have a soft spot for JRPGs, as some of his creations are clearly from Final Fantasy. Fans of the series will immediately recognize Cloud's Buster Sword from Final Fantasy VII, as well as a gunblade, the favored weapon of Squall from Final Fantasy VIII. I don't quite recognize the design of the rest of the weapons, but a few appear to be inspired by the anime series Bleach. Despite looking like props a convention attendee would slap together last minute, the replicas were reported have been sharpened to the point where they could actually cause harm, and the prison's Governer, Steve Cross, stated that the weapons were realistic enough that "[They] presented a genuine threat to the safety of staff, visitors and other prisoners." There's no word as to if the prisoner constructed the matchstick swords out of boredom, intent to harm fellow inmates or possibly for use in a grand adventure to save the world.